Received February 8, 2011; revised May 6, 2011; accepted May 27, 2011; published June 10, 2011. Figure 2 . Selection of Constitutive (Stable) Expressed Transcripts as Reference Gene Candidates for qRT-PCR Analysis of Lepidium sativum Seed Germination from Transcriptome Datasets. (A) Microarray datasets from Linkies et al. (2009) were used to select genes with constitutive (blue) and high (red) transcript expression in different seed tissues and at different times during seed germination without (CON arrays) and with ABA added to the medium (ABA arrays). Microarray expression values of the 15 reference gene candidates are listed in Supplemental Data Set 1 online. (B) Seed structure and seed size comparison of L. sativum and Arabidopsis. CAP (micropylar endosperm) and RAD (radicle plus lower hypocotyl) tissues were dissected from L. sativum seeds. NME = non-micropylar endosperm. (C) Germination time courses of L. sativum and Arabidopsis. For L. sativum the times for RNA extraction from specific seed tissues for the CON and ABA arrays and qRT-PCR analyses are indicated on top of graph. Only seeds prior to the completion of germination, i.e. with unruptured micropylar endosperm, were used for these analyses. 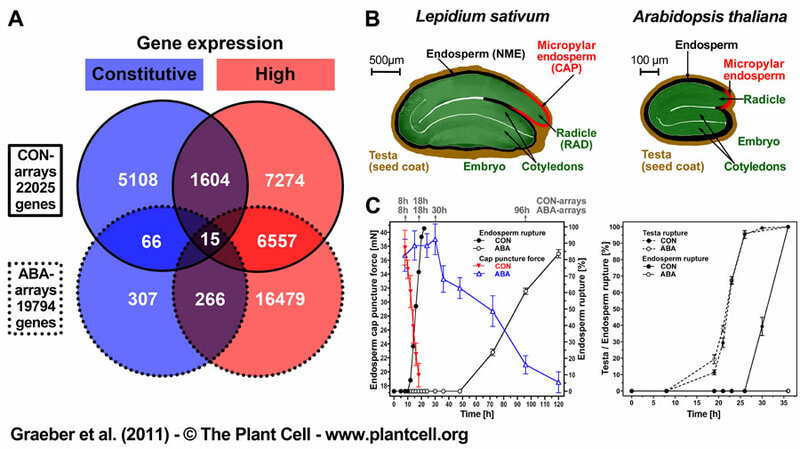 Both Arabidopsis and L. sativum have a two-step germination process with testa rupture preceding endosperm rupture (Liu et al., 2005; Müller et al., 2006). ABA treatment of after-ripened seeds inhibits endosperm weakening and rupture, but does not affect the kinetics of testa rupture. Synopsis: Developmental processes like seed germination are characterised by massive transcriptome changes. This study compares seed transcriptome datasets of different Brassicaceae to identify stable expressed reference genes for cross-species qRT-PCR normalisation. A workflow is presented for improving RNA quality, qRT-PCR performance, and normalisation when analysing expression changes across species.